Thanks to all the readers who have supported the recent launch of NeuroPolitics! I have been pleasantly met with curiosity and interest in the topics I’ve presented in part 1 so I thought I’d make a supplementary entry elaborating on some things. I encourage all readers to comment and ask questions about the NeuroPolitical material here. If you haven’t checked out part 1 of this piece, this segment might be difficult to follow. Below I respond to a reader’s questions about the left before clarifying and expanding on some of the points I made on sectarian politics. A: Thank you for your question. Although I personally have no access to brain imaging equipment to conduct this experiment on sectarians myself, I believe that dissecting the two as though they are not interconnected is not entirely accurate. Speaking scientifically, if you were to evaluate any conscious response to stimuli you would find the centers for conscious mental processing to be the last areas activated within the brain. By milliseconds, yes, but still last. What I tried to indicate in part one is that the conscious “differences” we hold in each of our minds are essentially built on an emotional foundation. We experience oppression and we are able to recognize and identify because of how it makes us feel. From that point we rationalize it. From this point, acknowledging that this emotional event is intricately laced with our cognition when interacting with others, we must consider how this would manifest in our interactions within the left. Is is most appropriate to meet a political opinion immediately with a political difference? In some contexts I think the answer is obviously yes. In others I think the answer is obviously no. 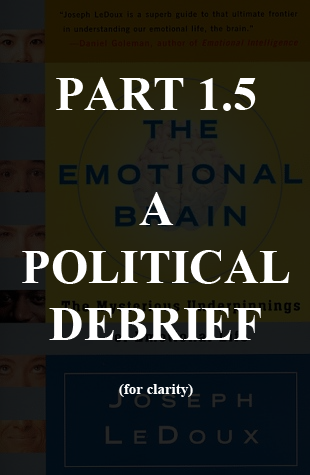 What’s important for political organizers to understand is the need to become conscious of this internal emotional process that can perhaps spur us into reaction when it is inappropriate. Thrusting forward differences and focusing our attention around differences in a political situation can potentially breed sectarian behavior in anyone’s mind. Consider for a moment how serious and passionately we feel about the life-threatening (atleast life-harming) implications of political issues. These are the strong emotions of empathy we are dealing with. Because emotions serve as precursors to action, I do not think it’s farfetched to believe that they can prime our drive and sense of purpose into a situation where we could either be blinded from another person’s true meaning or perspective (which is also based on emotion and rationale). What we as organizers must stress is our need to become effective communicators which are able to engage in effective and productive dialogues between one another. With these forces in mind I believe we can reproach politically “antagonistic” forces with a calm and calculated eye dedicated to understanding our political differences rather than simply identifying them. A: Of course! Again, my point was not to suggest that the emotional processes within in all of us invalidates our rationalizations of them. My purpose was merely to propose that they can interfere with our ability to communicate our conscious differences effectively without expressing sectarian attitudes. However, in order to avoid unnecessary splits, I believe it is important to take the time to evaluate and communicate these emotional feelings within the radical left in order to enrich our understanding of political struggle in the larger sense. If nothing else, our emotional responses are all we have in navigating any new environment and all political organizers must be conscious of people’s reactions and feelings about themselves and their organizations. To an organizer and his or her comrades, a practice could make all the sense in the world (and often does!) but if their methods for communicating that perspective frequently enrages and upsets those outside of their political niche their net force is essentially ineffective and isolating. Here I would like to elaborate on the subject of interconnection between emotions and political programs. The quotations below are all from part 1. For example, I would characterize the experiences that most gripped me emotionally as my lifelong encounters with racism, from a far, to me personally, and to the people I love. It was that pain, sadness and frustration that resulted from those experiences that thrust me into politics. I admit it is my tendency to most sympathize with the victims of racism. Although this is initially what brought me into the political world, I have come to understand and experience the struggles of others, broadening my political horizons. Fundamentally these experiences happened within my environment. Whether these things happen to a person directly, through the pages of a book, through news-headings, or through word of mouth, all of these things are “environmental stimuli.” All of these stimuli are of interest to the left because we are a community of sympathizing people; sympathizing which is an inherently emotional process. In the process of empathizing within the left, I believe this is a fact we oftentimes forget. No matter what “camp” we belong to in the left, we belong to it because we believe personally it is the most effective way of fighting the causes of oppression, the causes of pain and suffering. We do this because we are good people attempting to do good things. Approaching approaching individual practices with scrutiny, disbelief, and disgust is a hugely insensitive process on this level. Here is something Rev also shared with me. It is for this reason that I do not mean to suggest that we turn a blind eye to obviously fruitless actions. We should not abandon our principled differences with the practices of others, but we must approach people who seriously take it upon themselves to fight to bring about good with this basic understanding. It is only through engaging in dialogue can we realistically get at the root of a person’s understanding of the world we live in. This is a two-way road which requires the mutual acknowledgment of struggle. We in the revolutionary left are quite familiar with attitudes of dismissal from reactionaries and liberals. This is a situation where one party is not acknowledging the very real struggles of the other. Although from the non-revolutionary’s perspective, they are dismissing far more than they are usually aware of. In the mind of a liberal they have only become aware politically and emotionally of the struggles and issues deemed appropriate by the ruling class. Their environmental stimuli are carefully constructed by news corporations, the government, advertising companies, and the businessmen in wall street frantically tearing at the economy. This environment is a conscious one, intent on blinding a population from true causal forces in society and directing their consciousness towards consumption and apathy. This is worlds apart from the environmental stimuli of oppression and injustice. People are products of each of these environmental stimuli and it is this fact that sets the foundation for our countless political programs which interpret our world. This a dialectic we must accept. The Liberal movement at best becomes aware of the symptoms of oppression. The revolutionary movement is devoted to uncovering the causes of oppression. as true experience /humans will strive forwards. HEAVEN can one complete an brains full ability. answered/even such questions not as yet asked. in giving a clear picture clarity of understanding. teacher but a teacher of teachers/the very best. such experience in bringing one enlightenment. via spiritual experience/in clear understanding.